We are incredibly excited to announce that the CTA ALL SCHOOL MUSICAL is ANNIE. Annie is the perfect family-friendly musical and an ideal show for a largely female cast. *All students who want to be in the production MUST be registered for a class at the CTA. IN OTHER NEWS: We have just completed our 4th week of operation, and we continue to celebrate the CTA as we enter our 38th year of operation! We have new classes in every division, we’ve introduced some incredibly talented and dynamic teachers to our students and, as predicted — students and families are finding our programs and instructors to be incredibly flexible in our efforts to meet their needs and very busy lives. It’s never been easier to “TAKE THE STAGE AT EVERY AGE! ” – This year we have a record number of SOLD OUT classes and we continue to be VERY proud of WHAT we do and WHY we do it! The Center for Theater Arts is a 501 c(3) Non – profit organization that so very proud of WHAT we do and WHY we do it!! 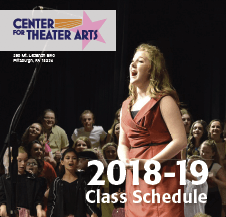 For over 38 years, the CTA has been offering high quality performing arts instruction with a fun, creative, challenging and exciting curriculum. In addition to our dynamic classes and productions, we provide an environment where we all have a role to play!!! We are much more than a place to take voice, dance, musical theater and theater instruction. We are confident that having classes at the CTA will be something your child will value the rest of their lives! The Center for Theater Arts remains dedicated to offering high quality performing arts instruction and is committed to providing all students, including those with special needs, opportunities to improve their self-image and self-confidence through artistic expression. If your still looking for classes, please give us a call, explore the website or stop in for a visit! Places everyone…. PLACES!!! !